More than a dozen precincts had for some reason dropped votes from when numbers were originally run, Bucher said. The office is looking into how and why that might have happened. The pressing reality that the county will not meet the deadline falls squarely on Bucher’s shoulders, she said. “I’m the Supervisor, I take full responsibility. That’s my job,” she said. However, Bucher has been vocal about the fact that the machines used in Palm Beach County are the most outdated in the state, and are only able to count one race at a time. Newer machines can read several races simultaneously. Three statewide races -governor. U.S. Senate and agriculture commissioner- were slated for a machine recount after the margin of difference between candidates fell below the 0.5 percentage point threshold defined by state law. Other local races in Broward and Palm Beach counties are also being recounted. Bucher has stated that the Nov. 15 deadline was “unrealistic” in light of the logistical challenges that her office faces. A Leon County court granted her request for an extension of the deadline to Nov. 20 for the county, but the Secretary of State office moved the case to federal court. At a federal hearing on Thursday, U.S. District Court Judge Mark Walker refused to extend the 3 p.m. deadline throughout the state for machine recounts. Another request to extend the deadline only for Palm Beach County remains pending. If that deadline is not changed, Palm Beach County will send the state the same results it sent last Saturday. The scene in a large Riviera Beach warehouse where ballots are being counted has been confusing and chaotic. There is no public relations person on staff to give updates, and Bucher herself only gives statements intermittently. Since Monday, reporters, Palm Beach residents who came to make sure their ballots were counted, as well as Republican and Democratic staffers and observers were left with unanswered questions for the majority of the recount. After trained in a quick group session, Palm Beach resident Petra Guiland was ready to do her part as an election monitor for the first time. But the hours ticked by and Guiland stood in line with a dozen other election observers. On Tuesday, Susan Bucher told reporters her staff was already close to finishing the recount for the U.S. Senate Race between Florida Gov. Rick Scott and Democratic opponent Bill Nelson. But with the sound of outdated voting equipment behind her, she also made it clear that the county was well aware that the voting machines needed to be updated -- for the last 5 years. “Currently there’s only 2 companies in the state of Florida, ES&S and Dominion, and Dominion does not have a high-speed counter as of yet, and ES&S is not in compliance with ADA [American with Disabilities Act] just yet,” Bucher told reporters. Then voting machines overheated and malfunctioned and the county was forced to restart the recount process after about 175,000 early-votes had been processed. WLRN news partner the Miami-Herald reported that that amounted to more than a day of work by election officials. During a hearing on Thursday hearing, US District Judge Warner scolded Bucher's office for not being on track to finish the recount on time, or for having "adequate systems" in place to count the ballots. “We have been the laughingstock of the world in election after election," he said. It’s not just problems with machines. 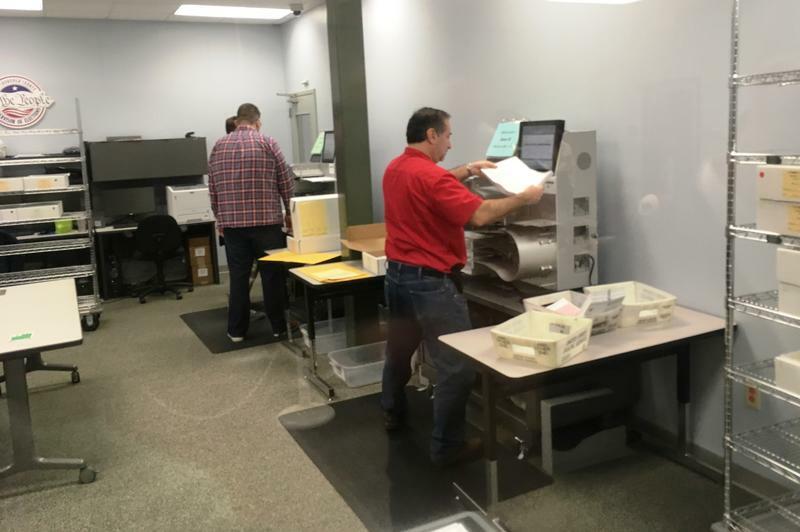 Bucher’s office was rebuked by another judge over the weekend for allowing her staff to make decisions on duplicated ballots without the county Canvassing Board, which receives input from candidates and political parties. That process was amended at the beginning of the week, but the outdated voting equipment complicated what should have been a simple process, said Mike Coleman, Chairman of the Campaign Committee for the Florida Democratic Party. The total machine recount for more than 8 million votes in the state is supposed to be finished on Thursday. Any races that are still within a 0.25 percentage point will then be subjected to a statewide hand recount. If any counties have not finished by the deadline, the Secretary of State’s office told the Miami Herald that they should keep on counting. At noon on Thursday, only two machines in the Palm Beach warehouse were spotted as working.